Nauratha refers to the nine holy nights that precedes Dashami during the festival of Dashain. During this period, the female member of the family, usually in Terai region keep fast for nine days straight. However, they do eat fruits and light snacks which could be considered chokho or pure. For the next nine days, starting from Ghatasthapana, they visit the Shakti Peethas, the temple of goddess Durga to worship her. Each day is dedicated to different forms of the goddess. 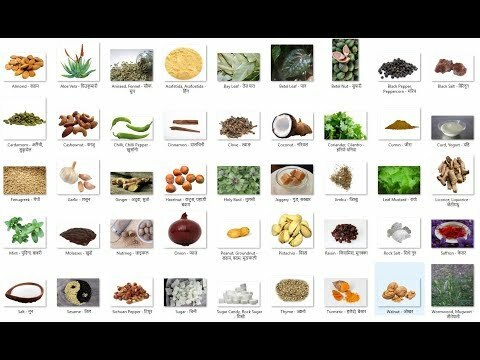 On the eighth and ninth day, animals are sacrificed at various different temples of the goddess. Adults, senior citizens and kids, all come to the temples, at least one day, during the festival. It is celebrated with much enthusiasm in Terai region than in hills as the tradition has been adopted from various communities in India, up to certain level. The temples are decorated with colorful papers and lights. 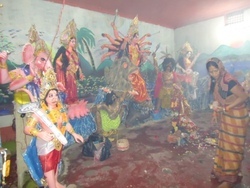 Images of the goddess killing the demon are erected at various temple premises. Also, a fair is held on the temple premises or a open field where the image of the goddess made out of mud is erected. Here are some pictures of Nauratha. 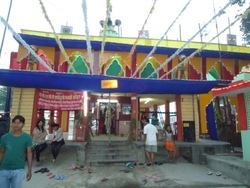 Bhagawati temple in Rajbiraj decorated during the Nauratha puja. 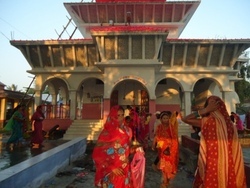 Devotees entering inside the Rajdevi temple in Rajbiraj for worship during the festival of Nauratha. 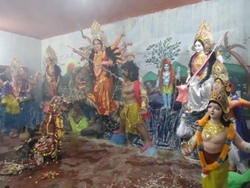 Idols of the goddess killing the demon while other gods and goddess look upon. These idols are kept locked in this room with their faces covered with paper and it is only during Nauratha that the people are allowed to enter inside for worship. A woman worshiping the idols that are otherwise kept locked inside the room in Bhagawati temple, Rajbiraj. Devotees worshiping goddess Rajdevi during the Nauratha festival. Rajdevi is considered as one of the most important temple in Rajbiraj and the place also got its name from the temple itself. 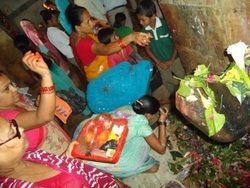 Devotees worshiping Lord Shiva in Rajdevi temple, Rajbiraj. 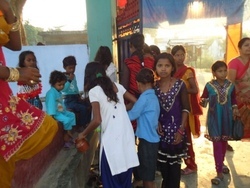 Small girls coming to worship the goddess early in the morning during the festival of Nauratha in Rajdevi temple. 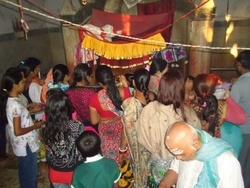 During this festival, people of every age group and gender are seen standing on the line waiting for their turns to worship the goddess early in the morning. A small girl preparing her basket before worship.